Photography copyright © 2000 by Tom Asp, all rights reserved. On Wednesday, May 3rd, I made one of my periodic trips to Legend's Bar and Grill at the Holiday Inn in St. Cloud, Minnesota to see the man known as the "Gypsy of the Blues," Mr. Eddie Kirkland. It has been over a year since Eddie last visited Minnesota and even longer (3+ years) since I last saw him perform live at the now defunct Biscuits & Blues in Minneapolis. Eddie's band, Energy, opened the show at 7:00 p.m. with Freddie King's classic, "Hideaway." This was followed by nice covers of T-bone Walker's "Little Girl" and Albert King's, "Oh, Pretty Woman." Guitarist Jim Thacker, who has played with Kirkland for over four years, showed off some fine guitar and nice vocals. Accompanied on bass by Jason Corbiere and newcomer, Dylan Roye, on drums, Energy prepped the audience for the entrance of the crimson-clad blues gypsy, Eddie Kirkland. 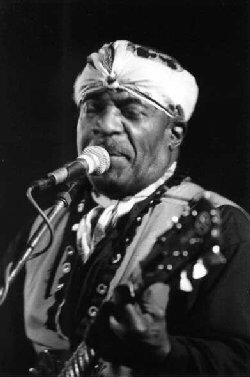 The Jamaican-born, U. S.-raised Kirkland, sporting his trademark scarf covered head, strode to the stage, strapped on his guitar and ripped into a frenetic version of B. B. King's "Every Day I Have The Blues." In just that one song, I could tell that Kirkland could still play a great blues guitar and that he still retained his powerful singing voice! From 7:00-11:00 p.m., Kirkland performed two long, powerful sets featuring songs from several of his recordings, most notably his latest release on JSP Records, "Movin' On," including the slow blues original, "Rainbow," and a ripping version of a song Kirkland referred to only as "Monkey." "Monkey" (entitled "Don't Monkey Around With Me" on the CD) gave all band members an opportunity to make a solo presentation on their respective instruments. Though Kirkland's sets were predominantly blues, he also pulled a couple of rock n' rollers out of his bag of tricks. His rocking instrumental lead-in to "Pretty Girls Are Everywhere" really got the crowd out of their seats and onto the dance floor. After 40+ years in the music business, Eddie Kirkland showed everyone at Legend's that he still got what it takes to play the blues. His youthful energy and exuberance were no more apparent that when, at the end of the first set, he jumped off of the raised platform stage (2-3 feet high) at Legend's, guitar in hand, playing and not missing a note. Then he proceeded to walk around the club and played some personal riffs for members of the audience. Even though I had to drive a few extra miles to see him, Eddie Kirkland's show was everything I hoped for, and then some. In my estimation, it was worth every mile and minute that I had to travel to see this blues legend. With any luck, I hope to see him again very soon. This review is copyright © 2000 by Dave "Doc" Piltz, and Blues On Stage, all rights reserved. Copy, duplication or download prohibited without written permission. For permission to use this review please send an E-mail to Ray Stiles.